Product & Design Quality - Great! Looked better than expected!Customer Service & Shipping - Received sooner than expected! Product & Design Quality - Everyone was very impressed with the sunglasses and were surprised by the low price!Customer Service & Shipping - The sunglasses arrived a day before they were supposed to. Overall, very impressed! Need Help? Call 855-657-4233 (Toll Free) for personal assistance. Increase your order to $500 or more to qualify for $34.99 off on your order today! We will send you digital proof for approval, this is for demonstration purpose only. Logo imprinted half-frame Oahu sunglasses – assorted colors make an ideal party wear due to its typical design featuring half frames. Offered in assorted colors, you can easily find the one, which suits on most guests attending your party. Empowered with UV400 protection, people can choose it for gifting during summer events. Ideal for party planners, travel agencies, schools, tradeshows and more. Wholesale half frame Oahu sunglasses would aid you to pocket huge savings and efforts. 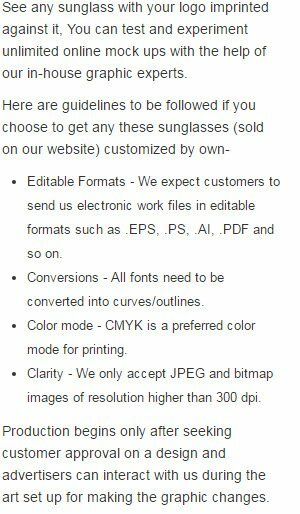 Request a quote to know savings that you can make on wholesale ordering customized half-frame Oahu sunglasses – assorted colors. Imprint Area: 2" X 5/16"
GET IT BY: ' + data.delivered_date + 'Need it faster? The number you've entered for assorted colors doesn't match your total quantity. What would you like to do? When ordering blank items of this product either exactly 1 or atleast '+36+' must be ordered! Yes. We offer free ground shipping on all sunglasses. It takes 2 - 5 business days. If you don't have any artwork in possession then we can create one for FREE and you are going to receive this FREE e-DESIGN PROOF in next 24 hours! SunglassVille is a registered trademark of Web4half.com, LLC.